Liz and Karl welcome you to stay at Crown Cottage Farm B&B, set in the beautiful Yorkshire Dales. 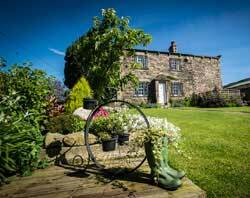 The farm is located in Embsay on the outskirts of the market town of Skipton, known as the Gateway to the Dales. The cottage is close to scenic Embsay Reservoir and Embsay Crag and offers a good base for great walks, cycle rides and touring. There are plenty of things to see and do. Skipton is close by with its market, medieval castle and Leeds/Liverpool canal offering day boat trips. Embsay Steam Railway runs trains every Sunday and more often in the summer season. Ilkley, Harrogate and York all make great day trips as well as the Bolton Abbey estate. Fountains Abbey, Malham Cove and Tarn and the Yorkshire Three Peaks. There are a lot of very good pubs and restaurants in Skipton and Embsay has two excellent pubs within walking distance of the farm which serve food. Crown Cottage Farm B&B Accommodation: 1 double room with en-suite, 1 double with private bathroom, 1 twin room with en-suite. All bathrooms have complimentary toiletries, towels and face cloths for your use. Rooms are centrally heated with flat screen TVs, tea and coffee making facilities and hairdryers. The lounge is a great place to relax in at the end of the day, with a cosy wood burner, TV and free wifi internet available.